Our tester had the automatic gearbox connected to front drive underpinnings and we found the turbo 1.4 quite satisfactory in rural and urban driving conditions with minimal noise, vibration or harshness transferred to the passenger compartment. Despite being called a compact, EPA sizing standards actually put Cruze just over the line into the midsize sedan category. 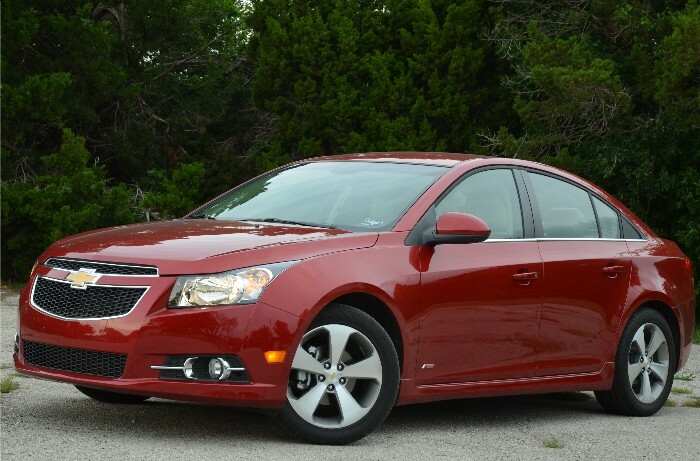 The 2011 Cruze from Chevrolet is targeted at the compact segment, specifically dominators Civic and Corolla. During the launch program GM provided us with a competitor vehicle from each of these other automakers and the Cruze handily stood up to the challenge. 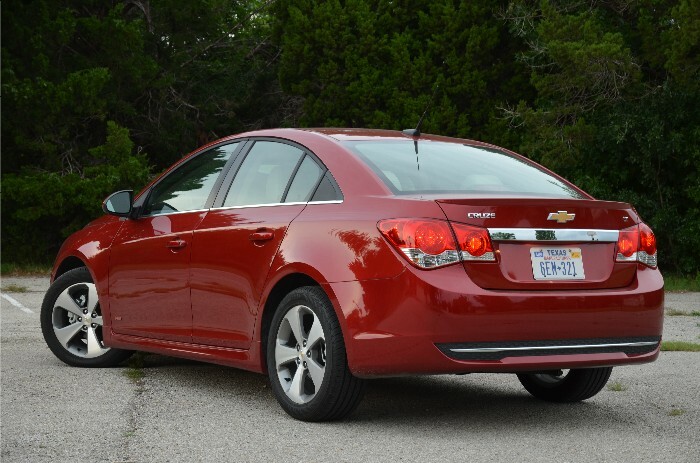 I found Cruze to be quieter and smoother with slightly better acceleration and more satisfactory steering and braking. Cruze is offered in LS, LT and LTZ trim levels. 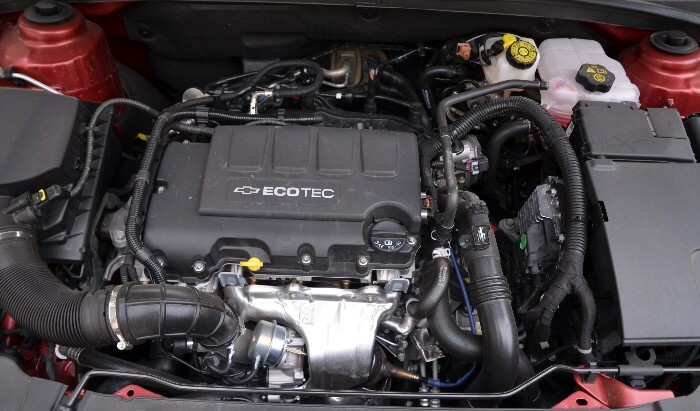 There is also a new Eco model that achieves 42 mpg highway fuel economy, something that will certainly aid Chevy in its drive towards tougher CAFE standards coming from big brother. 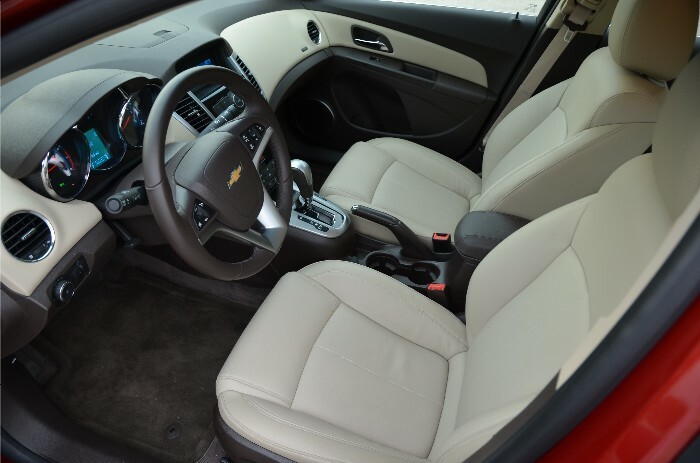 Cruze styling, inside and out, could perhaps be best summed up with “Honey, I shrunk the Malibu.” The new Cruze shares distinct styling elements of the larger stablemate – a good thing for the new Chevrolet. Safety takes no backseat in the Cruze either as not only does StabiliTrak stability control, traction control and ABS braking come standard across the line, so does no less than 10, count ‘em, 10 airbags, making this one of the safest vehicles in this segment – and beyond. Pricing for the new Cruze begins at $17,275 for a base LS with the 1.8L engine and manual gearbox. LT models with the 1.4 turbo kick off at $19,175 with the loaded LTZ starting at $22,975. Our test model featured a base MSRP of $20,675 and came to a final sticker of $22,910 after the RS package addition (rocker moldings, front and rear fascia enhancement, fog lamps and rear spoiler) and an upgraded wheel and brake kit. After our first drive of the new little Chevy we were impressed and those feelings have not waivered. The car is easy and, more importantly, enjoyable to drive. It replaces a vehicle in the automaker’s lineup so sales have been brisk right from the get-go and comes at a time when fuel conscious vehicles will again dominate the sales charts. The new Chevy Cruze has been picking up a few honors since launch. Just this week Ward’s editors recognized Cruze as having one of the “10 Best Interiors of 2011” and shortly after arriving in showrooms the Mobile Electronics Competition Association gave Cruze the crown for best factory sound system in its class. Chevrolet has partnered with Billboard.com in the “Battle of the Bands” competition where the six finalists will each “road trip” in a new Chevy Cruze to Las Vegas next month where a final battle will determine the winning band. * “Packt Like Sardines in a Crushd Tin Box” by Radiohead – Listen for the punch from the percussive bass, and the ring of the steel drums.